Whether you have disability problems or just enjoy the thought of sitting on a proper seat in a bath, then this is your perfect solution! 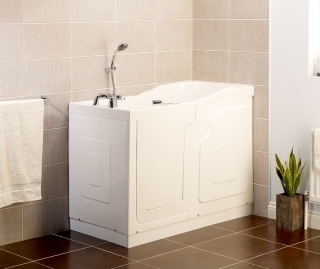 Entering a standard bath can cause problems, well your problems have gone with the Kubex walk-in bath. The back rest on the seat provides comfort and safety as does the slip-resistant floor. You also don't have to worry about any spillages on your bathroom floor as the bath is leak free. The Kubex bath can easily transform a room into a bathroom or en-suite without problems which you may have from a standard bath or shower. 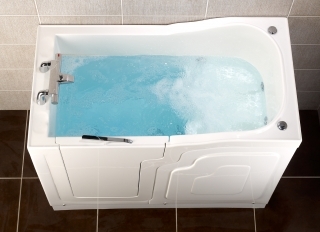 There is also the option of a luxury whirlpool system for that ultimate relaxation. With variable flow strengths the spa system is simple luxury in your own bath tub. The Kubex Solo Bath is available in several options - Standard or Whirlpool, and is also available as a complete package including Thermostatic Bath Shower Mixer, Shower Headrest, Hose & Riser Rail, Curtain, Curtain Rail & Hooks.